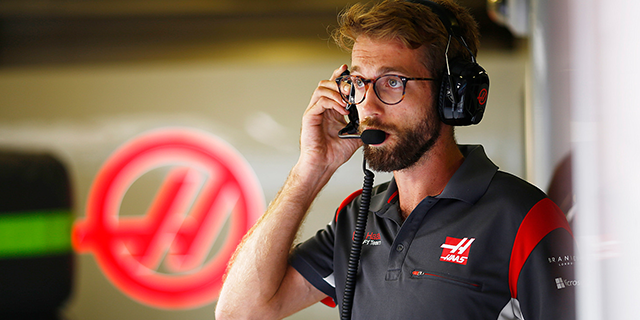 Kim Keedle (BPhysio 2012) combines his passion for sport and human performance in his role as Physiotherapist for Haas F1 Team. With a few equivalent Physiotherapy courses to choose from at the time, two things ultimately led me decide on the University of Melbourne. The opportunity to study at such a prestigious university was very enticing, and the central location and ease of access was another major draw card. Unlike many other undergraduate courses, we had a relatively small cohort who shared all classes together. We spent a lot of time together and as a result, I was able to form great friendships with fellow classmates throughout my degree. I have strong memories of anatomy pracs, certain lecturers who had an impact on me, days spent in the sun on the south lawn, numerous late-night library sessions, workouts at the gym, University Games and of course, a few university parties along the way. My ultimate goal was to find an exciting role in a professional sports setting. Following graduation, I worked in private practice for first three years before relocating to the UK. Here, I worked at the University of Leeds overseeing their Sports Performance teams. From there I jumped at the opportunity to work with Haas F1 Team in a full-time role travelling with the team. What drew you to sports performance in physiotherapy? What do you love about it? I’ve always had a passion for sport and love playing and watching it. I also have a keen interest in human performance and enjoy working with athletes to help strengthen their performance. When I first relocated to the UK I was working in the NHS as a locum where I had very little passion for my job. If this served one purpose, it was to instil in me the passion I have for elite sport and my desire to work in it. Athletes are goal driven and highly motivated and as such, they are a rewarding group to work with. What is it like working as a performance coach for the Haas F1 Team? Did you see yourself doing this type of work while you were still completing your degree? I have always been a fan of motorsport but I would never have pictured myself working in Formula 1 while I was studying. The role itself is new this year and I have enjoyed the opportunity to make it my own over the course of the season. My role is twofold – firstly I provide physiotherapy services for our race team (mechanics and engineers) and one of our drivers when we’re on the road. Secondly, I coach our pit stop crew, providing analysis and feedback around pit stop performance, initiating strategies to help us perform faster and providing general conditioning work, nutrition advice and information on recovery, travelling and more. This year there are 20 races across the season, throughout Europe, Asia, North America, South America and Australia and our team will be on the road for more than 200 days a year. We have a relatively small team so keeping them physically fit and mentally fresh throughout the season is essential to maintaining overall team performance. Can you tell us more about your role at the University of Leeds? What did a ‘normal’ day look like for you? Working at the University of Leeds was an invaluable opportunity. My role as Senior Physiotherapist for Sports Performance saw me covering 15 different target sports within the University, including athlete scholars and England funded athletes. Through this, I had the opportunity to work with numerous Great Britain Olympians, Paralympians, Commonwealth Games athletes and European level athletes. I also worked with the City of Leeds Swim Club, which is a junior elite swimming program, who had a Great Britain Olympian and multiple youth Olympians in their squad. A typical day for me at the University would include treating athletes in the morning, a lunch time gym session and then heading down to the pool in the afternoon for the evenings swim session. I also managed and mentored a junior physiotherapist and worked very closely with the Strength and Conditioning coaches. Wednesday’s in the UK University system is set aside for Varsity sport, so every Wednesday I would travel to games with the University 1st XV Rugby Union Team. Working with several Great Britain Olympic athletes and travelling around the world for my work. Being at the Monaco Grand Prix this year and experiencing everything it had to offer was also pretty special. Remember your goals and where you want to end up after graduating. Physiotherapy can be a difficult profession and there are various routes that can be taken. Work hard, learn, care about your patients and don’t forget to network! These things should hold you in good stead to achieve what you want.